I am a terrible blogger, I know. I haven’t updated this place in way too long, but after seeing a post on the Humans of New York tumblr, where the photographer has captured a Boston local’s hip-hop poem about peace in honor of the victims of Monday’s bombing, I wanted to share this with everyone. 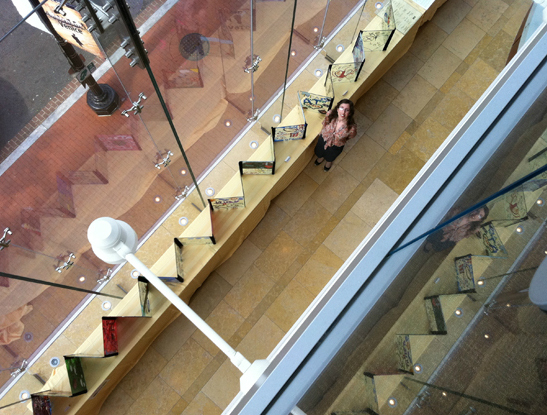 Me standing next to the entire “book” in D.C. 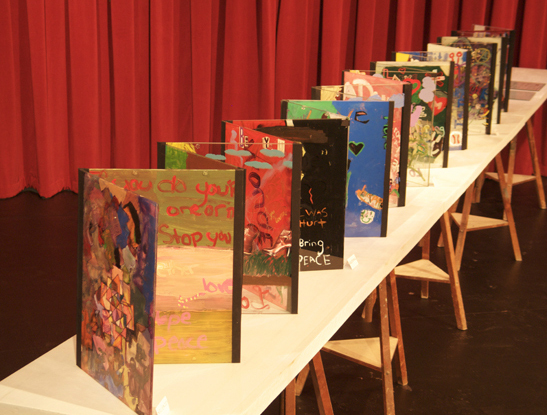 In preparation for the Dalai Lama’s “Power of Nonviolence” summit in 2011, the GlassBook Project collaborated with Rutgers MCJ Scholars and middle school students from Newark’s S. 17th St. School to create a forty-foot long accordion structure glass book that focused on finding peace. Specifically they were asked to look at the differences in how young people and adults seek, explore, and find peace. We did this to illustrate the many paths people take to find peace and to bridge some common misconceptions or presumptions adults have regarding youth. And with family violence and dysfunction playing such an important role in the development of children, the connection, dialog, and understanding stemming from this piece can facilitate peace. This book was unveiled at SAMHSA’s National Children’s Mental Health Awareness Day in Washington, DC. Student-artists also received recognition by Congressman Donald Payne, (D-NJ) and the U.S. Congressional Victims’ Rights Caucus. 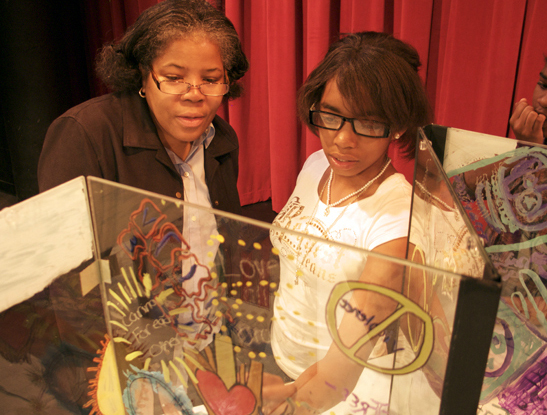 While some of the students were initially skeptical of how an abstract concept like ‘peace’ applied in their daily lives (many of whom had been touched by violence and tragedy), the end result was a gorgeous sculpture filled with love, sharp insight, empathy for others, and a view of the world around them that made us all truly hopeful and proud of the future in a way that sometimes the words and actions of adults do not. I wrote this poem for them. A closer view of the book. music. A pen, a black & white marbled notebook. bright stars in the night sky. who kept away the night monsters? One of the student-artists explains her images to a visitor. our own magic carpet ride. what you see on the panes. Posted in random acts of creativity and tagged art, boston, newark, peace. Bookmark the permalink. I’m still here! I’ve been in Portugal the past two weeks, and I had every intention of posting at least once while I was there, but it never happened. Blame the sun and the warm weather and the lure of the Atlantic Ocean beaches… it makes a girl lazy. I’ve only been back for a few days, but I already want to go back. I had so many great ideas for my story-in-progress while I was over there too. A few highlights of the trip: traveling to the area of central Portugal that my husband’s grandfather was originally from for the first time and meeting a waiter who just happened to have lived in Newark, NJ until he was 11, lying out on the beach, grilling the freshest sardines we bought at the Loulé market, hiking the marshes so close to the Faro airport that the planes took off directly over your head and flocks of flamingos flew off to their own private area inaccessible from the trail, karaoke with a group of very drunk Brits at the bar downstairs from our apartment, and the Ilha (island) de Tavira. I’ll give you all the full recap soon, but in the meantime, here’s a small photo teaser of the things I did and saw while I was there. 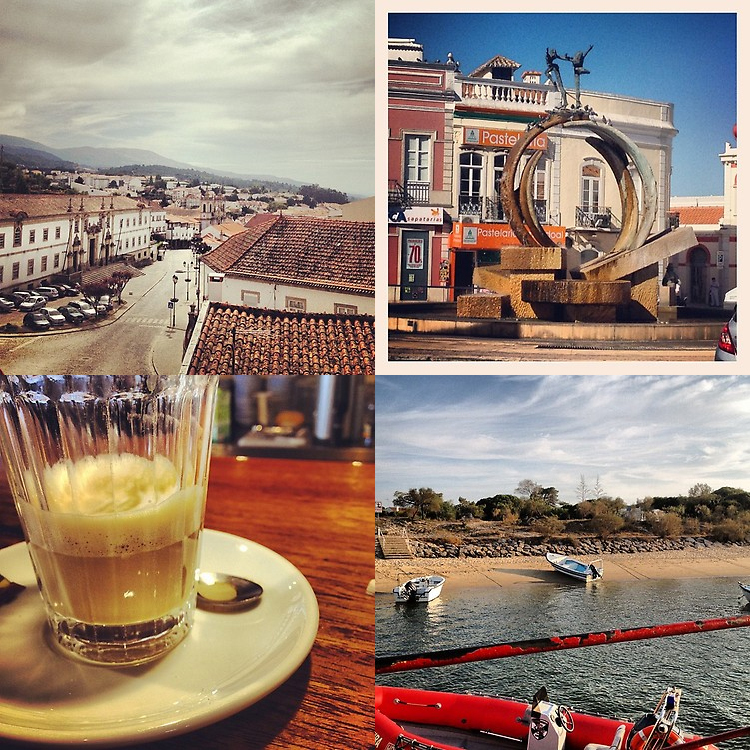 Clockwise from top L: the mountain town of Gouveia, Loulé city center, the Island of Tavira, and my very first galão of the trip from the bar downstairs. Posted in travel and tagged Algarve, Centro Region Portugal, Faro, gouveia, loule, Portugal, summer, Tavira, travel, vacation. Bookmark the permalink.